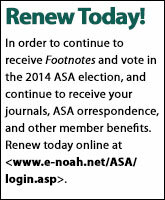 Footnotes | April 2014 Issue | Time to Vote! The 2014 election will be underway as of April 22. All members with valid e-mail addresses will receive instructions on how to access candidate statements and how to cast their votes online. Members who do not have email addresses, or who have non-working e-mail addresses will receive a postcard in the mail with voting instructions. Visit www.asanet.org to cast your vote. The election will be open for voting through June 1. For more information on the President and Vice-President candidates, see the March 2014 issue of Footnotes at www.asanet.org/footnotes/mar14/election_0314.html.